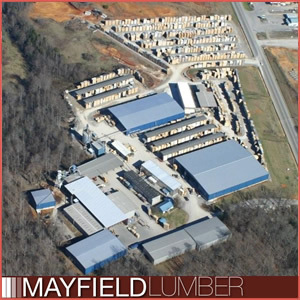 Mayfield Lumber sits on 78 acres, 268,000 sq/ft of which is covered. Our largest single warehouse is 51,600 sq/ft. Our newest warehouse, completed in December 2006, is 34,800 sq/ft. 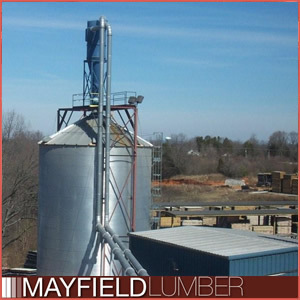 Since the end of our expansion in 2006, Mayfield Lumber now runs 10 kilns full time with a capacity of 950,000 bd/ft. Our first two kilns were built in 1981. By 1991 we had added two more kilns to increase output to 300,000 bd/ft. These first four kilns are standard masonry kilns, and will always serve as the cornerstone of our drying business. Kilns #5, #6, #7 were built in 2004, effectively doubling our capacity to 600,000 bd/ft. They feature an aluminum exterior and stainless steel interior designed by David Mayfield and Tommy Stiles. David added extra coils for additional BTUs and extra power venting for quicker removal of moisture. While designed for "white" woods, these kilns can dry oak as well. Kilns #8, #9, #10 that were constructed in late 2006. Capacity for each kiln is 105,000bd/ft. of 4/4 lumber. These kilns are designed for drying "white" woods with extra coils for additional heat and extra power venting for exhausting the moisture and extra fans for more air circulation. 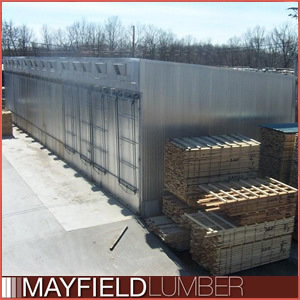 Soon after David purchased Mayfield Lumber he recognized his company’s unhealthy dependency on natural gas. 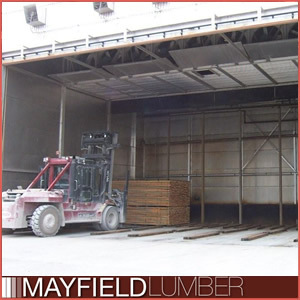 In 2002 Mayfield developed a plan to install a wood waste boiler system. We completely overhauled the dust systems when the wood waste boiler was installed in 2003. Two bag houses recapture all of the fine wood matter creating extra fuel and drastically lowering emissions. Using this environmentally friendly, “closed-loop” method, air quality is not compromised. Our vast expansion in 2006 also included a new stacker and a new planer. We now have 2 stackers, 1 de-stacker, 3 planers, 4 straight line rip saws. We have 6 Taylor fork lifts and have another on order. Our fork lifts have 8' forks and will lift in excess of 38,000lbs. Our wood waste boiler is rated at 650 H.P. and easily handles the 950,000 bd/ft of kilns and the walnut steamer. In fact, the present boiler would be able to supply enough steam to double current capacity. Every day we handle, move, stack, and ship 100,000 bd/ft of fine Appalachian Hardwoods.